Three nights in a row I heard “Mood Indigo,” and no two were even closely similar. 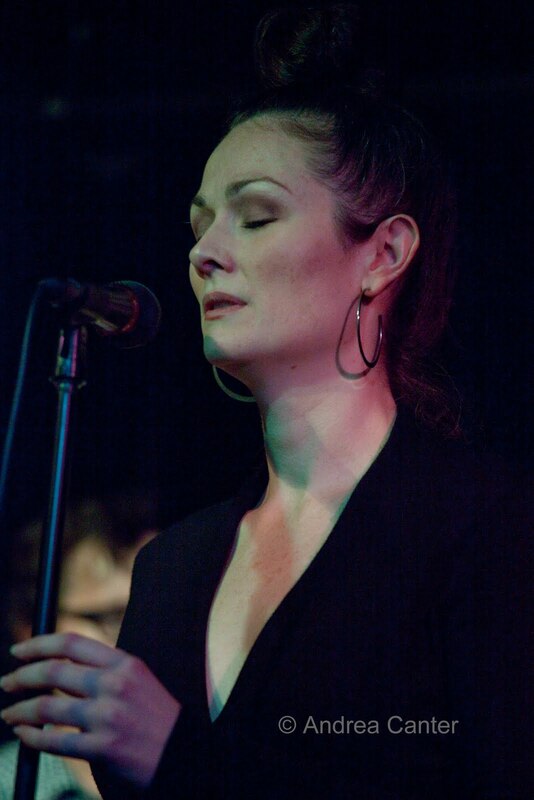 Nancy Harms sang an edgy arrangement by pianist Bryan Nichols; the JazzMN and Jazz at Lincoln Center Orchestras provided more straight instrumental readings, JALCO probably closest to Ellington’s own. That was just the weekend. 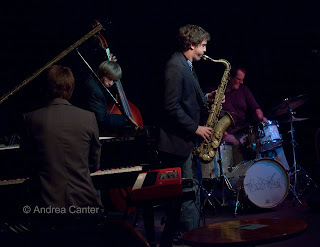 Dave Brittain, Gordy Johnson and Phil Hey brightened the one-year anniversary of Jazz Central and a quartet of young upstarts burned up the stage at the Artists Quarter. And some big ones got away from me, particularly Esperanza Spalding’s Chamber Music Society at O’Shaughnessy and Rhonda Laurie paired with Phil Mattson at The Nicollet. Nancy Harms at the Artists Quarter, September 30th. No matter how talented a young artist is, it is not easy to get that break that sends a career into orbit. Nancy Harms is the exception, not only because hers is an exceptional talent, but because she has really worked to get the breaks. Like sitting in everywhere as soon as she arrived in New York a year ago. Wycliffe Gordon heard her, and now she is gigging with the great trombonist and appears on a few tracks of his new release. She sings with him at a festival in France and then at Dizzy’s at the end of the month. But she had a gig near her Minnesota hometown last weekend and squeezed in a show at the Artists Quarter with a guitar ensemble headed by Zacc Harris. Many of the tunes of the evening appear on her 2009 recording, In the Indigo. But that was then, and this is now, and Nancy has only stretched her skills as storyteller and improviser. “Bye Bye Blackbird” with its voice/bass duet intro remains one of best calling cards, but like everything else she does, it’s morphing into something even more personal with each presentation. Something in her voice is just a bit more mellow, more confident, wiser. JazzMN Orchestra with John Clayton, at the Hopkins High School Performing Arts Center, October 1. We are really lucky in Minnesota to have such a top-notch jazz big band. With prime soloists in every section, it really is not essential to bring in a renowned guest artist. But it does add to the fun and gives the stars an earful of the best of Midwest. Bassist/composer/arranger/bandleader John Clayton did the honors Saturday night, mostly as animated conductor and arranger. Judi Donaghy sang the familiar “Bluesette” and the much less often sung “Whisper Not” during the local first set, Clayton coming on to direct the second set on his own arrangements of works by Horace Silver, Johnny Hodges, even every piano student’s “Heart and Soul.” A bluesy two-bass duet pairing Clayton with house bassist Terry Burns was perhaps the highlight of the night, and while some thought Clayton’s ten-minute solo was too much bass, I think there is no such thing in the hands of a master musician. Jazz at Lincoln Center at Orchestra Hall, October 2. The audience sang “happy birthday” to Wynton Marsalis, celebrating his 50th on his current tour. In return, we got perhaps the most animated, soulful performance I’ve heard yet from this star-studded band. Even Irvin Mayfield, Artistic Director of Jazz for Orchestra Hall, put in a comical as well as musical appearance, popping out at the start of the second set, trumpet in hand, and quipping “Oops, wrong concert.” The only dull step was oddly on the opening Monk tune, “Evidence;” otherwise it was an evening of superb soloing from all, particularly the gold-plated trumpet section of Kelly Rampton, Ryan Kisor, Marcus Printup, and, of course, Wynton. 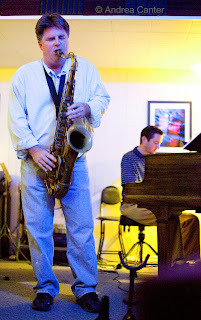 Phil Hey, Dave Brattain and friends at Jazz Central’s Birthday Bash, October 3. The Twin Cities best kept jazz secret celebrated a year of at least weekly performances and jam sessions in the lower level studio space run by Tanner Taylor and Mac Santiago. Tanner handled the keys, and Phil Hey gave Mac the night off, aided by Gordy Johnson and starring a hard-blowing Dave Brattain on tenor sax. Shorter, Silver and more were given high flying readings from some of the most energetic post bop I’ve heard around here. Brattain needs a wider following and more gigs to establish the reputation among listeners that he clearly has heard among fellow musicians. Tyler Anderson and the Coriolis Effect at the Artists Quarter, October 6. Six or seven nights per year, the Twin Cities Jazz Society presents its Young Artists Series at the Artists Quarter, featuring a high school or college level ensemble. Maybe the most savvy student band yet was the quartet from the University of Wisconsin-Eau Claire, led by saxophonist Tyler Anderson under the name Coriolis Effect. I have no idea what this effect is. But the effect of the music was undeniable—relentlessly inventive. Each member of the band (Anderson, pianist Cody Peterson, bassist Jordan Jenkins, drummer Mike Malone) contributed original compositions, and the set was paced as well as any pro outfit, a mixture of beautiful balladry and powerhouse knock-downs. And Tyler has already figured out how to engage the audience from the microphone. The lone covers came at the end, a better than average rendition of “All the Things You Are” featuring UW-EC saxophone professor Doug O’Connor duking it out with Anderson, and the encore “Bring It On Home to Me,” showing off the young guys’ gospel-blues chops. The band just recorded an EP with five of these tunes which will serve as a sonic business card for future gigs. And they will have plenty.